the most AIDS ravaged areas on the planet. to life saving antiretroviral drugs. One thing that struck me after returning from South America after the last trip was how lucky we are to live in Canada. It does not take a big sacrifice on our part to make a big difference in the lives of people halfway around the world who desperately need our help. local communities and providing life-saving antiretroviral drugs. If you would like to sponsor me in this event, please visit my fundraising page. It literally only takes a few dollars to save a life. Your life-saving efforts are much appreciated. 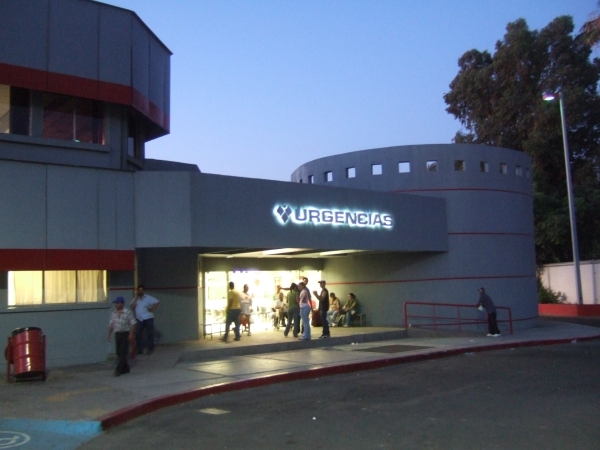 Hospital in Hermosillo, Mexico, where Ted had his right shoulder X-rayed. Over the holidays, I had the opportunity to spend a couple of days shadowing in a rural hospital and was exposed to the virtues of rural family medicine. I must say it was an eye-opening experience. Rural family docs do so much more than city family docs. In two days I saw a C-section and two vaginal deliveries. I was surprised to discover how much I enjoyed observing these. There is nothing quite like the moment when a new life shoots out like a cannonball. I even got to assist an inguinal hernia operation. There was also carnage from the local ski hill in the emergency department. There were over a dozen ski/snowboarding injuries, including two shoulder dislocations, one broken humerus, a rash of probable scaphoids (all casted just in case…hmmm) and one patient complaining of back pain (who turned out to be fine). There was a guy who fired up his dirt bike after a 10 year hiatus from riding and managed to fall off a 10 foot cliff with no helmet. Luckily the only damage was a broken rib. There were also a couple of lacerations requiring suturing. There was a guy who took slap shot to the face. There was a COPD exacerbation as well as a case of pneumonia causing severe respiratory distress in an elderly patient visiting from out of province. Working in emerg was addictive. You never knew what the next patient would present with. It was challenging and exciting. There was a lot of instant gratification from being able to do so many procedures right on the spot, from casting, to suturing, to draining abscesses, to inducing labour, to popping a dislocated shoulder back into place. I believe I would find rural family medicine extremely rewarding. It would give me the flexibility to work as much or as little as I want, allowing me to travel and practice medicine internationally. I am becoming more and more excited at the prospect of volunteering with MSF (Doctors Without Borders), an organization that has recently won the Nobel peace prize. To illustrate what kind of organization MSF is, consider that when the world turned its back on Rwanda during the 1994 genocide, MSF did not leave. MSF requires physicians to have worked a minimum of 1 year (preferrably two years) after completing residency in their home countries. This is conveniently how long it will take me to pay off my crippling debt. MSF also prefers physician volunteers who have had some kind of experience (travel or electives) in third world countries. My motorcycle trips through Latin America last summer and through Africa this summer would fulfill that criteria nicely.